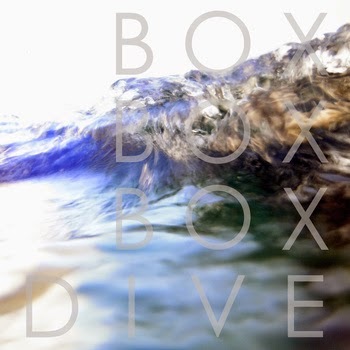 Boxboxbox are an electronic trio from Manchester and this is their new EP Dive. These guys have received praise from the likes of Andrew WK for their cover of his party stonking hit I Get Wet, and have also been working alongside the independent record label from across the pond Tree Machine Records. Hi Tree Machine Records! The band describe what they do as “blissy broken beats” which is certainly what opening track Signalsgives you. Waves of percussion, synths and vocal harmonies wash in and out of shore to create a sound that is very spaceous and off kilter, as if parts of body end up in the sand faster than other parts. Boxboxbox do a superb job of keeping this disjointed sound entertaining as they pack it with bass that fuses everything together, before finally combining all of the elements on the beach to create one big giant sandcastle that astounds the mind with a superb finale. A great start to the EP. Chelonics is another solid number with sweet melodies thrown into a hazy drum beat with additional harmonies included to create a sound that’s constantly on the move and full of groove and swing and all things good with the world. The instrumentation is upbeat and the vocals are bright to keep everything whirling through my head with a smile on my face. It’s great. The Andrew WK cover of I Get Wet adds a lot of volume to Dive with huge walls of synth introducing the listener into something that definitely leads to greatness. Boxboxbox cut everything right down to the roots with minimal drums and subtle female vocals before allowing things to get a little party up in here. It’s a great cover, certainly unexpected but the band somehow makes it work in the whole laid back, poppy scheme of things. All in all Dive is a wonderful escape into a sound that allows you to sit back and enjoy the music. Boxboxbox manage to make something so chill and yet full of sweet melodies, harmonies and beats that bring it to the best level of constipation. No wonder Andrew WK endorsed these guys. Stream Dive below and purchase it for however much you want, and for more music reviews, free downloads and many kisses to the face check out Exploding Head Syndrome on Facebook and Twitter.